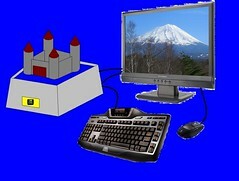 I'd like to introduce my Castle Gaming Computer. What we will have is a square base wall with stone brick patterns (Picture #1). Contained within that will be a small moat*. Resting on top of and within the water is the castle, which would be a four tower** and four wall design (picture #2), on the front wall will be a small wooden door***. In the center would be an open courtyard*4 (Picture #3) where the motherboard could be placed with a Plexiglas viewing panel on top (Picture #4). On the base wall in the back you could have all your input/output jacks and on the front base wall have a small gold (silver if it fits better with design) plate (Picture #5) engraved with your choice of wording *5. Concept Image at end. Hopefully you enjoy my idea, as a novelty or a final submission. Thinking this up was fun in itself. This computer being my brain child, would have to be a gaming pc as I am an avid gamer (FPS, MMORPG, RTS, I play them all), but could also be made as a simply internet browser, modders choice. * The moat water could be replaced with coolant and used in a liquid cooling system for high heat output components such as CPU and GPU. ** The four towers could all contain fans (size depends on scale of castle) and be topped with cone shaped, wooden shingled roof (Picture #6). *** The small wooden door could flip down with pressure to reveal a DVD drive or have a small motor to raise and lower the door when opening or closing disk drive. *4 This courtyard could also be made into a fifth tower for exhaust air or simply have a clear fan to allow for inter parts viewing. Blue led's would be a nice touch in viewing panel option was taken. *5 This wording could be anything from &#34;Nvidia ION, King of games&#34; or &#34;Nvidia ION, King of computers&#34; or &#34;Winning Nvidia ION design contest&#34; or anything else. Even just the Nvidia symbol could be a nice touch. Made with paint, If colours don't make sense I'm sorry I'm partially colour blind.